The most common central air conditioning system installed by AC contractors is a split system which consists of an outdoor air conditioner which has a condenser coil and compressor, and an indoor unit called an evaporator coil. This setup is usually installed in conjunction with your furnace or air handler. The compressor (air conditioner) pumps a chemical called refrigerant through the system to cool the air. R-410A is the current refrigerant replacing the older R-22 which is being phased out due to environmental concerns. We do not recommend that you purchase an air conditioner using R-22 refrigerant. An AC's performance is rated with a Seasonal Energy Efficiency Rating (SEER). This basically measures how much energy is required to cool a certain space. The higher the SEER rating the less you will pay on monthly utility bills. Once the hot air from inside your home blows across the evaporator coil (part of the indoor unit), its heat energy transfers to the refrigerant inside the coil. That transfer "cools" the air. Then the refrigerant is pumped back to the compressor where the cycle begins again. The heat absorbed by the refrigerant is moved outside your home while cooled air is blown inside. Moisture that contributes to humidity is also condensed out of the air. Your central cooling system is usually combined with your heating system because they share the same ductwork for distributing conditioned air throughout your home. In warmer climates where a furnace is not used, an air handler can be used to pump the air through the ductwork which helps your AC run efficiently. An air conditioner serves a single purpose: cooling the air inside your home. A heat pump however can cool or heat your home. Both air conditioners and heat pumps use R-410A refrigerant for cooling, but a heat pump can be used to provide warm air in the winter as well. Heat pumps are electric and can be used when a gas fuel source is not available to power a furnace. Heat pumps can also ideal for areas where average winter temperatures are 40 degrees and above as a heat pump is often cheaper to run than a gas furnace in such climates (depending on fuel prices). For areas that do not provide gas or where winter climates are more mild, a heat pump and fan coil take the place of an air conditioner and furnace. 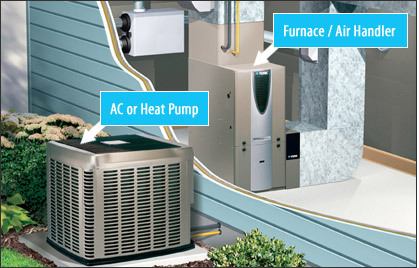 The heat pump is able to both cool and heat the home. When the winter climate is mild, and heat pump can be more efficient than a gas furnace. Programmable thermostats allow for efficient cooling and heating with seven day programming so you never forget and leave the air running while you are at work on a hot California summer day. Modern thermostats can also control indoor air quality components (like humidity levels) and provide remote dial in access so you can adjust the temperature in your home with a simple phone call. Click the thermostat simulator compliments of Venstar Thermostats to learn more about the different functions a thermostat provides. The Slimline Platinum Series offers the proven reliability and flexibility of Venstar thermostats. If you have had problems with inconsistent temperatures in your home, you would appreciate the flexibility of a zoning system. High ceilings, direct sun, windows and entry ways are all challenges in keeping your indoor comfort consistent. A zoning system allows for you to split up your home in separate zones, allowing indoor comfort control to be more specific based on your home's unique design.